During the Labor Day Weekend holidays, many Cape Region golfers will take part in a national fundraiser involving golf and our nation’s military families. You might want to join them. Patriot Golf Day runs from August 29 through September 1. The event is jointly supported by the PGA of America, the United States Golf Association, the National Golf Course Owners Association, and the Golf Course Superintendents Association of America. Participating golfers are contributing money for rounds played during the three-day weekend to support the Folds of Honor Foundation. The charitable organization’s mission is to provide scholarships and other support for the children and spouses of American troops injured or killed in combat operations. Last year’s event raised $1.1 million, and the organizers are hoping to go far above that amount this year. 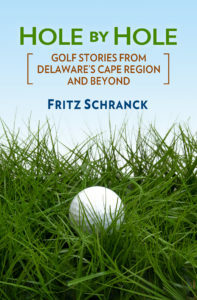 Several Cape Region golf courses and clubs are proud participants in this effort. They include Heritage Shores in Bridgeville, Shawnee Country Club in Milford, The Peninsula Golf and Country Club in Millsboro, Bear Trap Dunes in Ocean View, and Bayside Resort Golf Course in Fenwick Island. For more information on other participating facilities, or make a donation, visit www.patriotgolfday.com or www.foldsofhonor.org. Lisa Hutchins is the new women’s club champion at Shawnee Country Club, winning the competition with an 80-82-162 total during the recent two-day event. A banker by trade in upstate Pennsylvania, Hutchins and her husband Jim are three-year members of the Milford club, and frequent weekend visitors to the Cape Region. In fact, other bankers were a major influence on Hutchins’ decision to learn the game. “I was working at a new job, and after a while I noticed that all these guys were disappearing on Tuesdays after 2 p.m., leaving me to do all the work. I asked around, and the others said they were playing in a golf league. So I figured the best thing for me to do was to join them,” she laughed. After lessons at a nearby community college, the former high school volleyball player and tennis buff quickly picked up the game, and now maintains a 12 handicap. She not only won at Shawnee, but also took first place in the 2008 Executive Women’s Golf Association tournament in Stroudsburg, Pennsylvania, as well as the ladies’ club championship at Wild Pines Golf Club in Pocono Summit, Pennsylvania. “Those other championships were nice, but I really appreciated winning at Shawnee, because there were so many past champions in the competition,” Hutchins said. They readily agreed, but they still took the stroke. The Rookery’s Director of Golf has been doing some serious traveling lately, while earning a little pocket change in the world of professional senior golf. After playing in the British Senior Open, Pete Oakley traveled to Switzerland for the Bad Ragaz PGA Seniors Open from August 8-10. He tied for 56th place at 6 over par, earning a modest 546 Euros. He then traveled to Oregon for the Jeld-Wen Tradition, an official major tournament for the Champions Tour. On August 17, Oakley tied for 63rd place at 12 over par, which paid out $3,900. During the next week, he traveled back to Europe for the DeVere Collection PGA Seniors tournament, held August 21-24 at the Hunting Course at DeVere Slaley Hall, in Northumberland, England. Oakley played a little better, finishing in a tie for 42st place and picking up 2,113 Euros. By all rights, he should be pretty tuckered out.